The Prosecutor General (PG) Muhthaz Muhsin has left for Russia today where he will sign multiple agreements, officials from the PG’s Office have revealed. “One would be regarding extradition and the other on mutual legal assistance between the two countries,” said a spokesman. It is not clear whether the two countries would sign an agreement or an MOU, he added. Muhthaz got the invitation to visit Russia last November when the Russian PG Yuri Chaika visited the Maldives. President Abdulla Yameen had pledged to introduce a bilateral extradition treaty after the controversial detention of Russian national Roman Seleznyov in July last year. The alleged hacker was detained by Maldivian authorities before being transported to the US military base in Guam, with Russian authorities calling it a “kidnapping” by the US Secret Service. Despite a decline of 13 percent in the number of Russian arrivals last year – partly caused by the fall in the rouble – over 65,000 Russian tourists visited the Maldives in 2014, placing it fourth in terms of market share. PG Muhthaz left with Deputy PG Mahmood Saleem and legal affairs director Mohamed Iyas. The delegation will return to the Maldives on March 15. The PG’s trip comes during the state’s controversial prosecution of former President Mohamed Nasheed and former defence minister Mohamed Nazim. The Jumhooree Party (JP) and Maldivian Democratic Party (MDP) have questioned the independence of Prosecutor General (PG) Muhthaz Muhsin. Speaking at a joint press conference today, JP Deputy Leader and former transport minister Ameen Ibrahim said that Muhsin had become “someone who just rings a bell when a certain party asks him to”. Muthuthaz told media outlets yesterday that his office was looking into comments made by JP leader Gasim Ibrahim regarding the recently resumed hearings in the MDP leader Mohamed Nasheed’s case against the assembly of the Hulhumalé Magistrate’s Court bench. The conclusion of the High Court case – stalled since April 2013 – would clear the way for Nasheed to be tried for the 2012 detention of Criminal Court Chief Judge Abdulla Mohamed. Speaking at press conference at JP’s headquarters in Maafannnu Kunooz last night, Gasim called upon the PG to retract the case against the former president, saying he had already been punished for the judge’s detention by choosing to step down after being given a public ultimatum of releasing the judge or resigning. The PG swiftly responded by saying that Gasim, as an individual citizen, could not ask for the retraction of a criminal case, accusing him of going against the spirit of the Constitution. “Gasim is saying that the public offered Nasheed an ultimatum to resign or release Judge Abdullah. However, it is illogical that Gasim is saying that by resigning Nasheed has been punished for arresting the judge,” Muhsin told Haveeru. “Are we to believe that if the police commissioner resigned tomorrow after illegally arresting a lot of people, that he has been punished?” he asked. 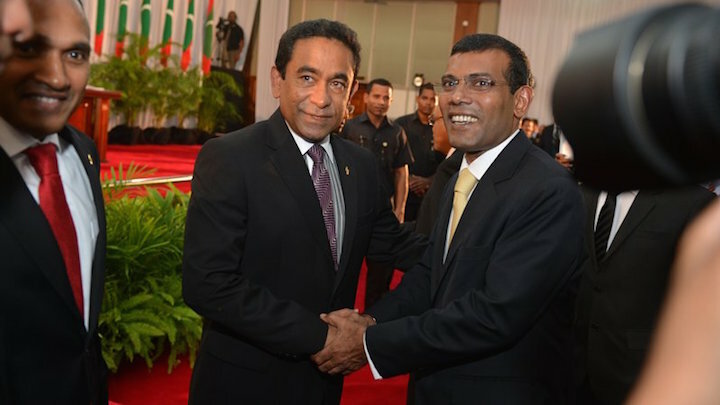 Gasim’s legal opposition to the first round results of the 2013 presidential elections – praised by international observers – led to their eventual annulment, before his endorsement of Abdulla Yameen brought the Progressive Party of Maldives’ candidate’s victory. Muhsin was appointed in July last year, more than six months after the previous post-holder Ahmed Muizzu resigned shortly before parliament was set to debate an MDP-initiated no-confidence motion against him. Muizzu was criticised by the MDP for failing to take action against mutinying police and military officers, who Nasheed has alleged caused him to resign under duress on February 7, 2012. Speaking at today’s press conference, MDP Chairperson Ali Waheed condemned the remarks made by Muhsin, pointing out that Gasim was the biggest businessman in the Maldives who has set up one of the few higher educational institutions. Meanwhile, a press statement released by Nasheed’s lawyers today noted that freedom of expression is a fundamental right guaranteed in Article 27 of the Constitution, as long as it does not go against the tenets of Islam. “We urge the prosecutor general to not take any action against the Constitution, by taking action against honorable Gasim Ibrahim expressing his opinion under rights guaranteed in Article 27 of the Constitution,” read the statement. The MDP-JP alliance to defend the Constitution began with MDP pledges to defend the Maamigili MP from attacks on his person and business. Minivan News was unable to obtain a response from the PG’s Office regarding the matter at the time of publication. Prosecutor General Muhthaz Muhsin has submitted terrorism charges against 89 individuals from Gaaf Dhaal Thinadhoo Island for the second time. Criminal Court Chief Judge Abdulla first threw out the Thinadhoo cases on Saturday (November 22) after state prosecutors failed to attend a hearing scheduled for 10am. Mushin resubmitted the cases yesterday, but the Judge Abdulla refused to accept the cases claiming he was uncertain if state prosecutors would cooperate with the trial. The PG office submitted a letter assuring Judge Abdulla of their cooperation, and has appealed his decision to reject the case at the High Court. The 89 are accused of setting fire to government buildings on Thinadhoo following former President Mohamed Nasheed’s ouster in February 2012. Judge Abdulla had last week ordered 55 of the 89 defendants be held in detention pending the outcome of the trials, claiming the accused were intimidating witnesses. All have since been released. The former president also said that the military’s detention of the judge during his tenure was “wrong”.